The herbs can be dry vaped at temperatures between 375 and 400 degrees Fahrenheit. 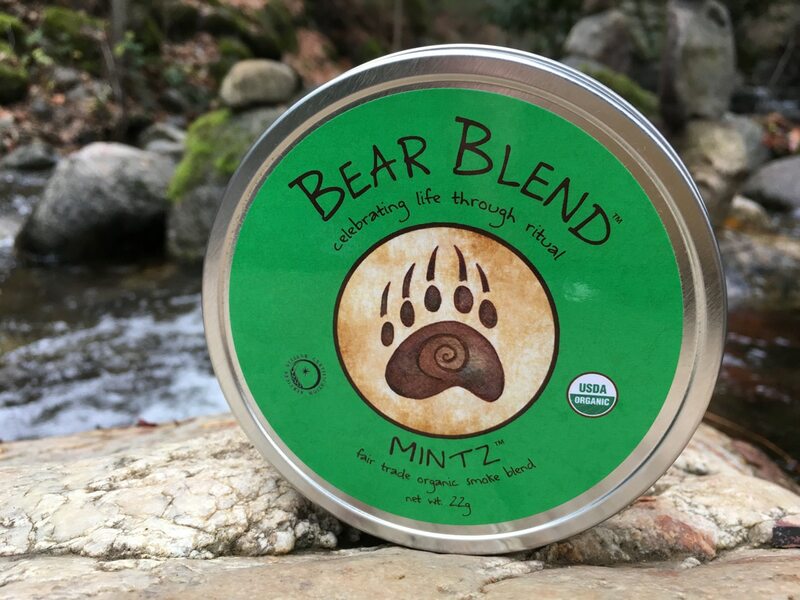 Bear Blend is made from the finest herbs; 100% USDA certified certified organic, biodynamic and fair trade. The blends are hand-crafted in a USDA certified organic facility in Southern Oregon. Bear Blend tins are 100% recyclable. Peppermint, Mullein, Red Raspberry Leaf, Lavender Flowers, Mugwort, Rose Petals, Catnip, Calendula Flowers, Damiana, Lobelia and Fair Trade Vanilla Bean Powder. What is a Ceremonial Blend? I really like the flavor of this blend. I mix it with a little organic tobacco for a very nice smoke. I purchased the Mintz herbal blend. I didn’t habe any expectations in my mind for this product. I’d tried other companies that sell similar herbal blends, but none of them worked, I just got a stinky room and a headache. That is not the case with this Bear Blend! I got the tin, which is much larger than the other guys and at the same price. The tin has a use by date, the lid was sealed, the ingredients are posted on the back, and all of their well earned USDA and Free Trade badging. Once I opened the tin the smell was amazing! You instantly smell the peppermint with a hint of tea. I chose to smoke this blend, I used a basic pipe and the draw was smooth, the flavour was amazing with a burst of mint! The smoke wasn’t harsh, I just got a little dryness in my mouth from the mint. For me it took about 5 minutes for any effect to kick in, but when it did I was impressed. I felt a sense of calm and stress free, my mood changed to that of a relaxed state, and I just felt like walking around the yard. This product is amazing. I’ve had a few smoke sessions with it, and I will continue with this product. I believe the next time I order from Near Blend (which is my new exclusive source for herbal smoke) I will drop down the funds to get the bundle pack that comes with every blend they offer. Well worth the price! Top quality blends! These people truly know what they are doing, and I hope they never stop. I don’t like to smoke weed because it gives me anxiety, but this was so soothing and relaxing. It gives me something to puff on while my boyfriend smokes a joint. It tastes nice af and i had a MINT sleep after!!! I was looking into smoking a mugwort blend after reading about its uses for spiritual and magickal purposes in various witchcraft groups, and I found Bear Blend after some research. I’m the type of person who can’t smoke cannabis because it makes me hallucinate to the point I’m convinced I’m dying, and it just isn’t fun. The Mintz blend just makes me super relaxed and calm, without the “high” of cannabis. I suffer from C-PTSD as well, and this helps with my anxiety. In the future, I wanna try Moon and Dreamlodge, and some of the Liquid Herbz as well.